From the Terra Collection, Reginald Marsh’s painting, Pip and Flip, and his Riders in A Mermaid Tunnel Boat, a double-sided drawing, are exhibited along with paintings, drawings, prints, photographs, film clips, ephemera, and artifacts depicting Coney Island attractions in the exhibition, Coney Island: Visions of an American Dreamland, 1861-2008. 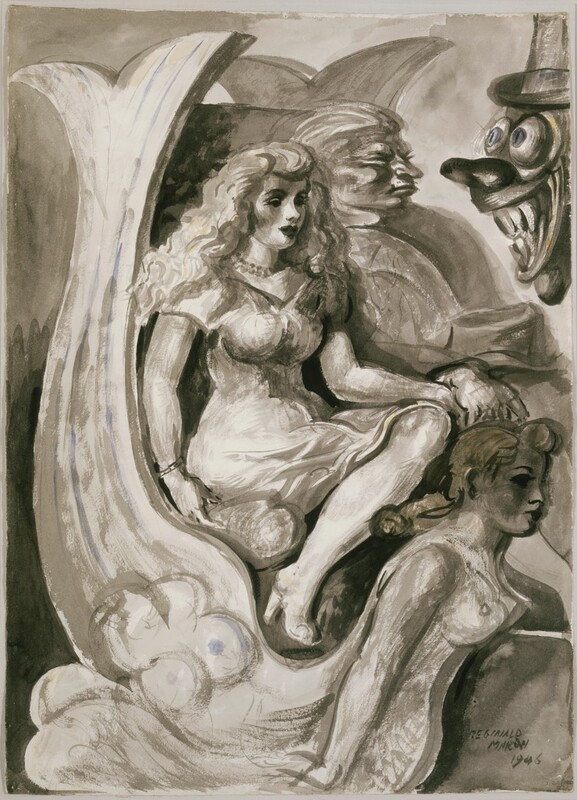 Riders in a Mermaid Tunnel Boat is one of two drawings Reginald Marsh made in 1946 on a single sheet of watercolor paper. At each venue for the exhibition Coney Island: Visions of an American Dreamland, 1861-2008, one side of the work will displayed. The drawing on view will alternate for each venue of the tour.